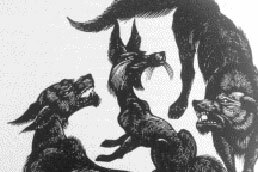 In 1985, the wolf’s relationships with other living creatures became the topic of the celebrated “Wolves and Humans” exhibit at the Science Museum of Minnesota. The 6,000-square-foot display won awards, set attendance records and eventually went on tour in 19 cities around the United States and Canada. More than 2.5 million people learned about wolf behavior and wolf lore and viewed the animal artifacts and masks, the wolf-kill diorama, and groundbreaking research tools. The wolf biologists who consulted in the creation of the exhibit began planning for its return to Minnesota. Dr. L. David Mech gathered representatives from private, public and professional groups to form the Committee for an International Wolf Center. 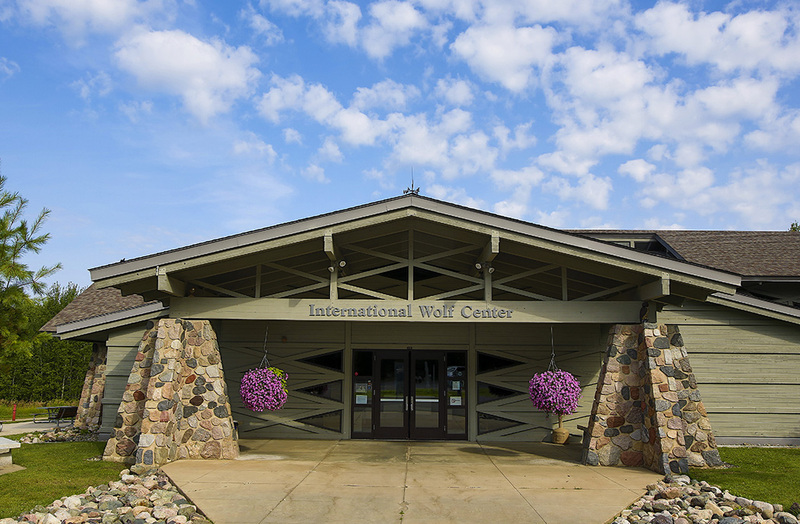 The goal: a permanent home for the exhibit and an international center promoting public education about the wolf. 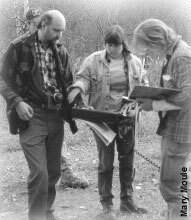 The site search for the nonprofit center ended in the heart of the largest wolf population in the lower 48 states, Ely, Minn. By 1989, a temporary facility was established there, on the edge of the Boundary Waters Canoe Area Wilderness. For more than eight decades, gray wolf research conducted near Ely has informed the world about this species and has contributed to its repopulation in the north woods. Sigurd Olson, a world-renowned naturalist, made the first noted studies in the 1930s. Milt Stenlund conducted a second wolf research project from 1948-1952. The quality and sophistication of wolf research in the area grew throughout the years and continues today under the direction of Dr. Mech, who has tracked and studied wolves there since 1966. The foremost international expert in the field, Dr. Mech generously interprets his research for the Center’s educational programs and serves on the board of directors. The International Wolf Center opened the doors to its $3 million, 17,000-square-foot facility featuring the “Wolves and Humans” exhibit in June 1993. State funding of $1.2 million and $400,000 in donations from individuals and foundations paid for the expansion of the Voyageur Visitor Center in Ely. A $125,000 grant for construction and promotion of the Center was received from the Iron Range Resources and Rehabilitation Board (IRRRB) in Eveleth, Minn. In 1998, a 3,260-square-foot addition provided a 120-seat wolf-viewing theater and more classroom, storage and laboratory space. The expansion was funded by a 1996 bonding bill in the Minnesota State Legislature. The Center’s flagship facility features triangular windows designed to represent wolf eyes and ears. The observation windows look into a 1.25-acre wolf enclosure and den site that is home for the resident wolf pack. Four wolves, born in April 1993, served as the original ambassadors for the educational mission of the Center. They were joined by two arctic wolves in the summer of 2000. Since then, older wolves have moved into a retirement enclosure, and new pups have been introduced to the pack about every four years. The Center’s Ely facility offers a variety of educational programs for adults and families. Afternoon, weekend and week-long visits include howling trips, radio tracking, snowshoe treks, dogsledding, videos and hikes. Programs are custom-designed for groups of all ages. Since its inception, the membership in the Center has grown to include people in all 50 states and 38 countries. Membership provides funding for educational programs. The Center accomplishes educational outreach beyond its Ely facility through a comprehensive Web site at www.wolf.org, a quarterly magazine, classroom visits to more than 13,000 students every year, web cams on the resident pack, international symposia and a distance learning program that virtually brings our educators and wolves into classrooms in real time. People around the world are touched each year with educational messages about the wolf. By teaching people about this mysterious predator, the Center aims to ensure a future wilderness complete with the exciting howl of the wolf.